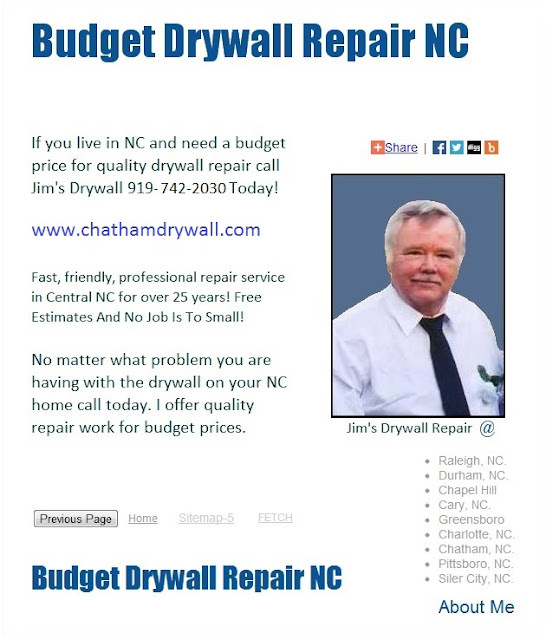 chathamdrywall.com is a local contractor that has provided service in Pittsboro, Siler City, Chatham County, NC and all surrounding areas for over 26 years. People that love their homes is what you will find when you come here. Some are new residents and many have lived here for years. People of all walks of life call Chatham County home. Shopping and fine dining is available in a matter of minutes in any direction. If you own a home here and need wall, ceiling repair or texture removal service call Chatham Drywall today. chathamdrywall.com Chatham Drywall is capable of handling all things related to drywall repair or drywall installation. The services of other drywall companies cannot compare to those drywall services that we have to offer you in Chatham County. Currently, there are quite a number of drywall contractors to choose from; however, none of them can live up to our level of professional drywall expertise. Allow us at Chatham Drywall to help you enhance the comfort of your home with our professional drywall services. So you think you need drywall work done. Is it an addition, repair or remodeling project? This is not a problem for us at Chatham Drywall, being a licensed drywall contractor, we are always ready to get the job done. Our drywall experience rivals that of our primary competitors. Where else will you be able to find a commercial and residential drywall draftsman that will give you drywall plans that are high quality? Our professional and reliable drywall services offer free estimates, bids, prices and cost-quotes. No job is to large or small. Are you worried that hiring a contractor for drywall addition will be too expensive? We can guarantee you that our company boasts the best drywall prices on the market. For each job, we will provide you with a drywall estimate that will be stick to. Additionally, we always stick to our drywall construction schedule, so that we can make certain that every time the job is completed on time. No Matter What Problem You Are Having with your joint tape it can be corrected and look great when friends, relatives and neighbors visit your home in Chatham. Nail Pop, poorly finished drywall joints, loose cracking metal corner bead or joint tape, holes, cracks, water damage walls and ceilings can look like new again for a reasonable quote! If you are in need of residential wall plaster or drywall services, we are the ones to call. We are also the ones to call if you are in need of small repairs. Our repair services include water damaged Sheetrock, ceiling, wall and patch repairs. We can even finish your drywall project for you, if you are not satisfied by the work another contractor performed on your home. Removal services are also a part of the services we offer. Do you have mold? It can be dangerous and we can safely remove mold drywall for you. Popcorn ceiling removal is not necessarily a dangerous job; however, it is certainly out dated, and we do offer this removal service. Home drywall service is very important and should be left to the professionals. Do it yourself projects with drywall can end in disaster if you don't have the right tools like scaffolding. Equally important is the right house drywall plans-remodels & additions. With the right plans you can improve the value of your home. It is not easy for an amateur to handle home drywall addition blueprints; as such, you should leave your drywall home remodel planning to us. We are Chatham Drywall | Pittsboro | Siler City, NC. Your home will look great when friends, relatives and neighbors visit . Chatham County, NC Nail Pop, poorly finished drywall joints, loose cracking metal corner bead or joint tape, holes, cracks, water damage walls and ceilings can look like new again!